The phone rang in Sean Callahan's new office in Calcutta, India. The soft voice on the line told him to start loading trucks with supplies and to be ready to leave in two hours. People in neighboring Bangladesh, struggling with heavy flooding, needed help quickly. Despite knowing that traffic wasn't being allowed to cross the border into Bangladesh, Sean obliged and readied the trucks. As the aid trucks approached the border, to no surprise, a line of trucks were being stopped and inspected by border patrols. When patrolmen approached the truck, the driver pointed to his traveling companion, the soft-spoken woman who organized the trip. When the patrolman saw Mother Teresa sitting in the front seat of the lead truck and her sisters in the Missionaries of Charity in each of the other trucks, they were promptly escorted to the front of the line and allowed to cross the border and offer aid to suffering Bangladeshis. Mother Teresa, who was born on August 26, 100 years ago, had a long history of working with Catholic Relief Services to help the poor across the globe. Her inspiration helps CRS carry on her mission today. 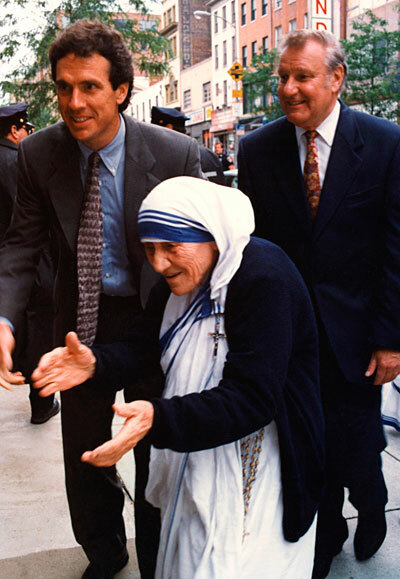 After taking over as CRS' country representative for eastern India in 1994, Sean's first order of business was to meet with Mother Teresa to discuss the relationship between CRS and her sisters of the Missionaries of Charity. "She was always very available to CRS," Sean says. "She credited CRS with being the organization that provided, before they really got going, a lot of their early assistance. Whenever they needed support or help, they came to CRS." Mother Teresa, often in partnership with CRS, worked every day to fulfill her mission of helping the poorest of the poor. The Missionaries of Charity and CRS continue to work closely on a daily basis to provide an orphanage for children in Calcutta. CRS helps the sisters running the orphanage near their Mother House by providing nutritional food and education for the children. Among Mother Teresa's many passions was operating a center for the dying in Calcutta. To Mother Teresa, this was a place where anybody could come to receive care, treatment and companionship in their final days. Sean was one of many people to see the Missionaries of Charity in action by volunteering in the center. "No one should be forgotten," Sean says of Mother Teresa's philosophy. "Even those who are suffering and that are dying, and that may not recover and may not be productive citizens also should have the opportunity for human dignity and respect and to finish their life here in a manner that we'd all feel comfortable with. If you went to any of her centers or places, the fact that people were doing this work joyfully, to me, was the incredible part." Beatified by Pope John Paul II in 2003, Blessed Mother Teresa was revered for her tireless work in Calcutta by people of all faiths in the region. Her center for the dying was often staffed by Christian, Hindu and Muslim volunteers who worked happily to help those in need regardless of religious affiliation. "Sometimes there would be traffic jams in Calcutta, as you can imagine. Sometimes people would move out of the way and they'd say 'Mother's coming' and people would let her go through," Sean says. Mother Teresa also had a personal relationship with CRS and our staff in Calcutta by making herself available to offer advice and counsel to CRS staffers. "It really was more like a familial relationship than a partner relationship," Sean says of his time working with Mother Teresa. In the fall of 1995, Sean was stricken with multiple illnesses that required his return to the United States to take a new job at CRS headquarters in Baltimore. On his last trip to Calcutta before starting his new post at CRS, Sean stopped to see the sisters of the Missionaries of Charity one more time. He was told that Mother Teresa was visiting the United States in May, and she would love to visit with him in Baltimore. Even though her itinerary had been finalized with the U.S. Secret Service, which provided the security for her trip, Mother Teresa requested that the plans be changed to accommodate a brief visit to CRS headquarters. 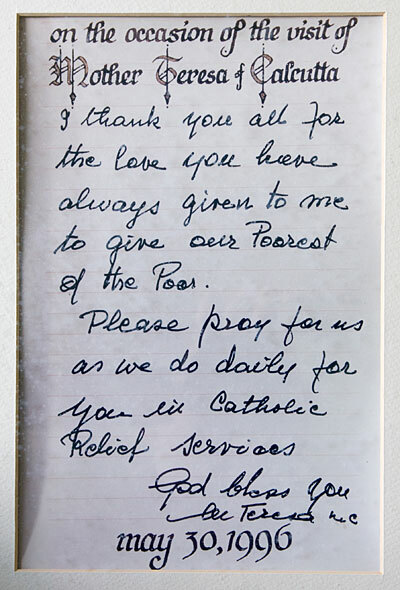 On May 30, 1996, CRS staffers and their families lined a long hallway inside the former CRS headquarters building just to catch a brief glimpse of Mother Teresa during her short visit. 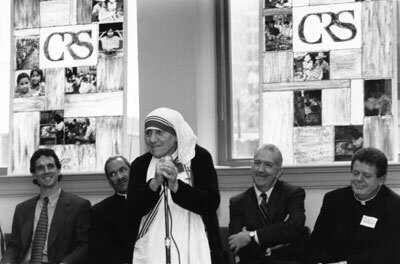 Instead, Mother Teresa, acknowledging her longtime relationship with CRS, insisted on speaking to the audience and personally greeted everyone who showed up to meet her. Mother Teresa's work demonstrated her true passion for helping the poorest of the poor live a life of dignity. Through her work with the Missionaries of Charity and her relationship with CRS, she was able to touch the lives of people across the world. Along with the Missionaries of Charity, CRS continues Mother Teresa's work throughout the world to help those most in need. "It was just her whole presence and atmosphere," Sean says. "You'd have to admire and smile as you saw her."